Living Room across the series. 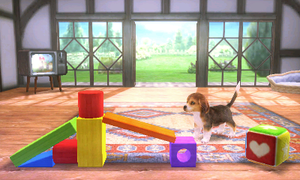 Living Room (子犬がいるリビング, Living Room with Puppy) is a stage in Super Smash Bros. for Nintendo 3DS and Super Smash Bros. Ultimate. It takes place in a living room set in the Nintendogs universe. The main arena starts totally plain, but some time later, building blocks will appear above the characters (if any characters are below them, they will be damaged). The building blocks stack up into various structures that can be stood on; some time later, they disappear, starting the cycle again. A television is in the background, displaying an image of a Golden Labrador Retriever puppy wearing a Mario Hat, and a Kitten wearing a Luigi Hat. If a puppy or kitten approach the TV to watch it, images on said TV will begin changing. Once they walk away, it will reset to the puppy and kitten in the Mario and Luigi hats. Besides the blocks, other household objects can make random appearances on the stage, such as a high-heel or a toy mouse. Also in the background is a random puppy, ranging from a Beagle, a Toy Poodle, a Jack Russell, a Golden Retriever, a Shiba Inu, or maybe even a young Tabby Cat. The order of appearance of these animals is random. 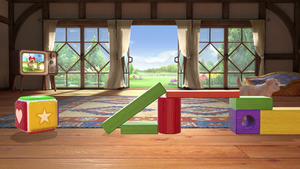 In Super Smash Bros. for Nintendo 3DS, the main platform of the Ω form is made of building blocks that extends below the blast line. No objects fall from above, and of the dogs is still in the background. In Super Smash Bros. Ultimate, the Ω form and Battlefield form are similar to SSB4's Ω form; however, the main platform does not extend below the blast line and is resized and reshaped to match Final Destination and Battlefield, respectively. The three soft platforms of the Battlefield form are flat, multicolored building blocks. Ω form in Super Smash Bros. for Nintendo 3DS. Ω form in Super Smash Bros. Ultimate. Battlefield form in Super Smash Bros. Ultimate. The Country Home living room as it originally appeared in nintendogs + cats. Living Room is based on the "Country Home" from nintendogs + cats for the Nintendo 3DS. In the game, players are tasked with taking care of a variety of dogs and cats. While the owner does not appear in the stage, a variety of toys usable by the pets can be seen in the background; among these toys include a television set and ropes that the dogs and cats can sometimes play with. The television set itself shows a variety of images featuring dogs and cats wearing hats based on Mario, Luigi, and Toad; all of these images are taken directly from the various Nintendogs games. Many of the platforms are also items in Nintendogs, such as the gold bar. Living Room in Super Smash Bros. for Nintendo 3DS. Cats may also appear on the stage. A variant of the stage featuring a different structure made of building blocks and a high-heeled shoe. Cloud in front of the TV in the back of the living room. Wolf, Chrom, Lucario and Fox in front of the fireplace on the right side of the living room in Ultimate. Piranha Plant being hit by Jigglypuff's Sing on the stage. If Kirby uses Stone before the blocks fall down, he can stand inside them when he returns back to normal. This can be seen here. This can also happen when a character sidesteps with perfect timing, in which case the blocks will disappear much more quickly. This page was last edited on April 16, 2019, at 07:37.